Habitat loss and fragmentation are major threats to biodiversity worldwide. Madagascar is among the top biodiversity hotspots and in the past 100 years several species became endangered on the island as a consequence of anthropogenic activities. In this study, we assessed the levels of genetic diversity and variation of a population of mouse lemurs (Microcebus tavaratra) inhabiting the degraded forests of the Loky-Manambato region (Northern Madagascar). We used a panel of 15 microsatellite markers to genotype 149 individuals. Our aim was to understand if the elements contributing to the heterogeneity of the landscape, such as forest fragmentation, roads, rivers and open habitat, influence the genetic structure of this population. The results showed that geographic distance along with open habitat, vegetation type and, to some extent, the Manankolana River, seem to be the main factors responsible for M. tavaratra population structure in this region. We found that this species still maintains substantial levels of genetic diversity within each forest patch and at the overall population, with low genetic differentiation observed between patches. This seems to suggest that the still existing riparian forest network connecting the different forest patches in this region, facilitates dispersal and maintains high levels of gene flow. 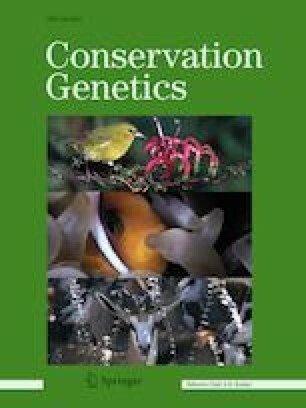 We highlight that special efforts targeting riparian forest maintenance and reforestation might be a good strategy to reduce the effect of habitat fragmentation on the genetic diversity of extant M. tavaratra populations. Isa Aleixo-Pais and Jordi Salmona shared first co-authors. The online version of this article ( https://doi.org/10.1007/s10592-018-1126-z) contains supplementary material, which is available to authorized users. We thank the Direction Générale du Ministère de l’Environnement et des Forêts de Madagascar (Région Sava), Madagascar’s Ad Hoc Committee for Fauna and Flora and Organizational Committee for Environmental Research (CAFF/CORE) for permission and support to perform this study. We also thank the NGO “Fanamby” (especially S. Rajaobelina and V. Rasoloarison, P. Ranarison, S. Velomora, F. S. Tsialazo, and S. Wohlhauser) and the local communities of Daraina for their warm reception and support. This study benefited from the continuous support of the Department of Animal Biology and Ecology, University of Mahajanga, and the Department of Animal Biology, University of Antananarivo. We warmly thank the many local guides and cooks (in particular Amidou, Rostand, Ismael, Nicole and Fatomia), as well as the local KMT responsible for sharing their incomparable expertise about the forest and help in the field, misaotra anareo jiaby. We also thank A. Beck, M. Barnavon, S. V. Meyler, and A. Besolo for their help in fieldwork. We thank the Genomics Unit at the Instituto Gulbenkian de Ciência for the genotyping service, in particular to Susana Ladeiro. We are very thankful to Tiago Maié, Rita Monteiro and Inês Carvalho for their invaluable help during data analyses and comments that greatly improved the manuscript quality. This research was funded through the 2015-2016 BiodivERsA COFUND call for research proposals, with the national funders ANR (ANR-16-EBI3-0014), FCT (Biodiversa/0003/2015) and PT-DLR (01LC1617A). It was also partly funded by the Fundação para a Ciência e Tecnologia - FCT (ref. PTDC/BIA-BEC/100176/ 2008 and PTDC/BIA-BIC/4476/2012 to L.C., SFRH/BD/64875/2009 to J.S., PD/BD/114343/2016 to G.S. and SFRH/BD/118444/2016 to I.P. ), the LabEx entitled TULIP (ANR-10LABX-41; ANR-11-IDEX-0002-02), the LIA BEEG-B (Laboratoire International Associé – Bioinformatics, Ecology, Evolution, Genomics and Behaviour, CNRS), the Rufford Small Grant Foundation (Grant 10941-1 to JS) and the Groupement de Recherche International (GDRI) Biodiversité et developpement durable – Madagascar. The authors also declare that they have no conflict of interest. We conducted this study in agreement with the laws of the International Primatological Society Code of Best Practices for Field Primatology, and with the countries of Madagascar, Portugal and France. The research authorisations [218/10][220/10][113/011][118/011]/MEF/SG/DCB.SAP/SCB were obtained in Madagascar and, the export and import CITES permits 485C-EA09/MG10 and 593C-EA10/MG11 were requested from both Malagasy and Portuguese authorities.